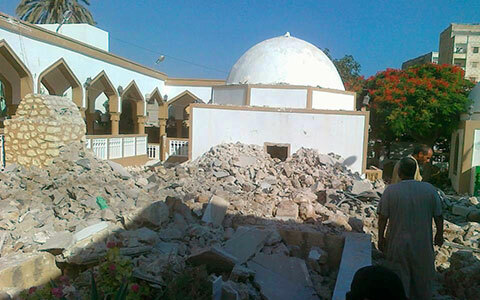 News Flash: On Friday, 25th August, a group attacked the tomb of 15th-Century scholar Abdel Salam al-Asmar in Zlitan, about 160km (100 miles) south-east of Tripoli, Lybia. The Reuters news agency said its dome had collapsed. The attack came a day after hardliners the deviants were accused of damaging the tomb of a Sufi scholar in the city of Zlitan. A shrine in the Libyan capital Tripoli venerating a Sufi Muslim saint has been partly destroyed - the latest in a series of attacks blamed on ultra-conservative Salafi Islamists by neo-Khajirites. On Sunday 26th August 2012 the Salafis deviants came at night 3 AM while people were sleeping and dug out the blessed resting place of Hazrat Shaykh Ahmad Zaruq Alayhi Rahma. Shaykh Ahmed Zarruq, one of Islam's greatest scholars ever. These cowardly men have been digging up, bombing and bulldozing sacred grave sites in Libya for the past week. It is also reported that the vandals have taken the blessed body of Shaykh Ahmad Zarruq and removed it at unknown location and the Salafis the neo-Khajirites are on their way to destroy the tomb of a blessed companion (sahabi), Ruwayfi’ b. Thabit al-Ansari in Libya. (Credit: Journey of a Seeker of Sacred Knowledge). This falls in a series of incidents of rising ignorance. In October 2011, raids on Libyan Sufi sites included the desecration of the Al-Masry shrine in Tripoli and the extraction from their burial crypts within it of the bodies of two Muslim scholars, Abdul-Rahman al-Masri and Salem Abu Seif and reburied according to the principles of the hardline Wahabi school. 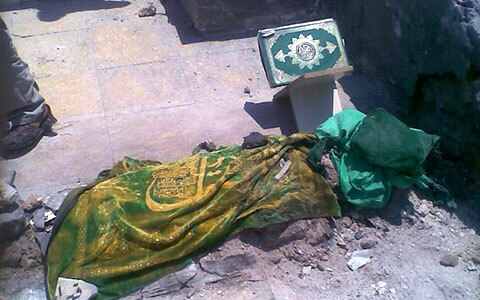 In January 2012 fanatics had wrecked the cemetery of Sidi Ubaid in Benghazi, stealing 31 corpses. The recent brutal terrorist acts of rampage carried out in the name of Islam in Timbuktu, destroying the ancient tombs of Muslim saints and threats to wipe out every religious shrine in the fabled city known as the city of 333 saints is an act of malicious transgression which needs to be unanimously condemned and rejected by all true Muslims. Over the past two years, Sufi shrines and their visitors have become victims of terrorism in Pakistan, Egypt, India, Libya and now in Mali. We as Muslims, openly condemn violent attacks on innocent lives, property and places, and safeguard sacred sites. Allaah says, “Had it not been for Allaah repelling some people by the means of others, monasteries, churches, synagogues and masaajid, in which the Name of Allaah is much remembered, would have beem demolished.” – Surah al-Hajj 22:40. Many people have been killed in the attacks during the past few years. 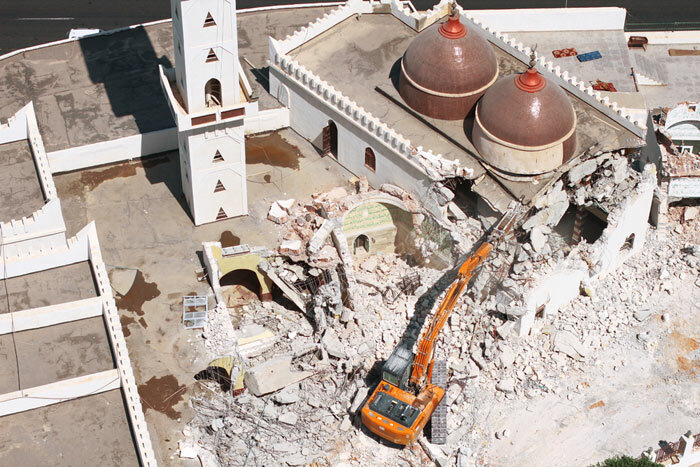 These attacks are designed to promote fear, chaos, and disunity among Muslims. Annas bin Malik (ra) narrates from the Prophet (salalahu alayhi wa ahli wa salaam) who said: “Three things are the roots of faith (1) To refrain from (killing) a person who says “laa illaaha illa-llah” (2) Not to declare him unbeliever for whatever sin he commits (3) and also not to declare him out of Islam due to any of his deeds.”…[Abu Dawud]. Alas! How people lose their sense of what is due to people of high maqam, the saints and awliyas. From one perspective this is an extremely painful situation that there has been on-going attacks and destruction of holy sites, tombs, libraries of rare manuscripts, heritage sites of great historical value and places of worship across the world, be it in Saudi Arabia, Pakistan, Egypt, India, Mali or Libya. One has to be in a demonic state of mind to dig up graves and bones out of contempt. We make supplication to Allah and request all to make du'a that these barbaric acts stop immediately, that the responsible are brought to accountability and justice. But this will not be enough because it also requires education, and there is a great responsibility on part of the people of truth (ahl-al-Haqq), the haqqani Ulamas (real religious scholars) and those who are true Sufi Educators (Authentic Sufi Shaykhs) to educate the common people about real teachings of Islam, tolerance, the respect due to the spiritual heirs of the Prophet (s) and what it means of to be an Awliya and their status with Allah, all Glory be to Him. We are seeing this situation precisely because many Sufi Masters of the age have stopped doing their job properly and they have fogotten their role as educator and communicators of truth. In every single lands where such destructions are taking place, on the ground the Sufis have forgotten the sacrifice made by their spiritual elders, their tireless work to educate people and to keep Islam alive in the hearts and soul of mankind. This aspect of failure on the part of those who adhere to the Sufi Schools calls for serious contemplation and real introspection since every event offers us a opportunity to read deeply the Signs of Allah. If we try to understand the real situation on the ground we can not deny that we have arrived at such situation and many other sorrowful states of the Muslims (facing a new order of Jahiliya, the return of another kind of age of ignorance) because traditionally those who are bestowed with the spiritual authority and responsibility, namely the Sufi Guides and the Religious Scholars (Ulama) who are positioned in the direct chain, hence who are suppose to carry out and continue the work of the Rasul Allah (s) of educating, purifying, teachings wisdom and providing guidance - it is them who have for the past two generations or more are miserably failing in carry out their sacred responsibilities which have enabled the re-emergence of Jahiliyya. We have even failed to teach our children, our young the value of sitting in the presence of the scholars, of the people of remembrance - which is a direct instruction of Allah in the Quran. "Be with the siddiqin, the truthful, the sincere and the righteous people" - says the Quran. For sometime now (historian and academics can tell accurately when this stagnation and fleeing from responsibility has arrested the Sufis) the Sufi Masters are fleeing from their responsibilities and those who are ignorant and know nothing about Islam have ceased the opportunity to impose their ignorance which is evident across the globe. The corrupt people are in charge (for example the Mufti of Libya follow the school of the ignorants of this age, credit) and they are uttering all sorts of non-sense to ignorant people capitalizing on their lack of knowledge about the Deen. The degeneration of true spirit of Sufis have occurred everywhere. In the country where I come from and live, here in Bangladesh (and its the same tendency all over the Sub-Continent, probably same is true for Sufis in North Africa as well) that those who claim to be Sufis (and even those with authentic silsila and authorization) they themselves have reduced their Sufic activities into business by displaying the maqam / tomb of their ancestors, close door gatherings reserved only for their disciples while forsaking the entire community and so on and so forth. So there is no effort of educating others, no struggle (jihad) of propagating the lofty ideals and Sunnah and complete abandonment of the tradition of leading the Ummah in calling to good and forbidding the evil. As a result what happened is nothing surprising. They are found caught by those who now rule over them with ignorance that even dwarf, in some cases the classical Jahiliya period. At one time Islam was greatly propagated by the Sufis and now a days in most places they are the laziest bunch; at one time the Sufis were the most forthcoming in serving all, and now a days they are the people who expect and demand that others serve them. This is a serious reversal of Sufi ideal and we can not afford to be surprised at these actions. This group that has left the Muslims, rebelling against them – this is the result of disassociating oneself from the scholars. ... They broke away from the scholars, broke away from the Muslim leaders, and the disbelievers and hypocrites put these ideologies into their heads. So, they have become outcasts in Muslim societies. They are Khawārij, no doubt. This act of theirs is the act of the Khawārij. Now if we look at now how Imam Ali, may Allah ennoble his face, (notable one of the early Sufis of the Golden Chain, many Sufi orders goes back to him as their Grand Sheikh immediately after the Messenger) dealt with them, we will find that he took the issue very seriously, divided his troops and ordered them to catch the dissenters before they could reach major cities and disperse among the population. This shows the seriousness on his part. Imam Alī's cousin and a renowned Islamic jurist, Abdullah ibn Abbas, pointed out the grave theological errors made by the Kharijites in quoting the Qur'an, and managed to persuade a number of Kharijites to return to Alī based on their misinterpretations (credit). This shows the effective attitude of educating them and correcting their faults. This is exactly what the Scholars of Tasawwuf and Educators must also do in our present situation. Name calling and distancing from members of the Ummah by looking upon them, by calling them this and that, cursing them, pointing out how wrong they are - is not the solution, rather to work with them, sitting down with them, debating their masterminds and educating them is what is required at this time. Every image of destruction of holy sites of Islam is a naked reminder that there is something very very wrong within and people those who are suppose to carry out spiritual works are failing to attend to their sacred responsibilities. Else why we have to endure such pictures where even the Book of Quran is not spared by this vandals who call themselves Muslims and defender of Islam. otherwise don’t be occupied with the foolish talk of the Sufis. Sufis have stopped guiding the common people: Many Sufis somehow distanced themselves from the common people when it comes to giving counsel, guiding them, admonishing them, warning the rulers when they are corrupt etc. These were tasks commonly performed by earlier Sufis. Even the Sufi Saint whose tomb is destroyed very recently they were such great activists and reformer that some of them are responsible for bringing the Message of Truth and Harmony to the North Africa, they were tireless servers of community, some even fought actively to drive the oppressive and thief colonialists away and fighting for independence. Even though the Sufis claim to be the people of haqiqa, they have forgotten the haqiqa (reality) of not leaving / forsaking the Jamat, the community, as warned against by the Prophet (s) himself. Role as Educator is ignored: The Sufis who carry the flag of the Messenger also bear the responsibility of educating people, purifying them from deviant/ ignorant activities and constantly reminding people about the greater reality of the Hereafter. But for sometime Sufis, for example those who are in Sub-Continent, they are busy in making money, turning the tombs into a business and giving their time at a price only to those who are willing to make donations. If one visits the shrines of great Sufi Masters in Indian Sub-continent who have sacrificed their entire life in educating others, you will find no trace of education, no dispensing of knowledge and guidance but transaction of money, material gifts and cheap entertainment, none of which has nothing to do with the life and mission of the True Sufi Saints. Shutting themselves: Now a days many Sufi Guides have confined themselves into their own corners and not reaching out, not willing to speak out, acting out against violence, oppression and injustice. Their gatherings are often not for common people but for chosen few. They have forgotten traditionally their gatherings where aimed to attract the common people while organized and maintained by the inner circle, so that they could dispense true advice to the maximum members of greater community. Many now a days even refuse to give information about their gatherings to public. For some extra-ordinary cases it may be necessary, but making it into norm is denial of the Great Sufi Teachers of the Golden Age who traveled to great length, so that they could meet people from all walks of life, freely give advice and guide actively. Their private time with their Lord didn't prevent them from calling people tirelessly from the dunya to the Way, as did the Messengers and the Prophets of God in every age. The case of Sufis shutting themselves from going out among the common people, working with them, guiding / teaching them, warning them and reminding them of the greater reality - they are like physicians who place himself at a place which is off-limit to those who need medical treatment. As a result the society all over is filled with sick people and no wonder these zombies are now coming back to haunt with their number one weapon of mass destruction: Ignorance (Jaheliyya). Coming back to the specific incident of destroying the graves and shrines, lets look at what our Beloved Prophet's way was. Here are some Traditions worth mentioning to understand his way of being when it comes to respecting the dead, let alone the Saints of God about whom there are dire warning already issued by God Himself through the agency of the Messenger as we find in Hadith Qudsi: "Allah said this: "Whoever harms a friend of Mine (awliya), I declare war against." The Prophet instructed, "If a bier of anyone passes by you, rise to your feet and remain so till it disappears from your sight or buried in its grave." Qais Ibn Sa'ad and Sahl Ibn Hanif told that when they were in Kadisiya a bier passed by them and they stood up on seeing it. When they were asked why they have behaved like this since the bier was one of the unbelievers of the area, they replied that once a bier passed by the Prophet and he stood up. when it was said to him that the dead was a Jew, Muhammad said: "Was it not the holder of a human being?". The Prophet used to go towards the end of night to Al-Baqi' (grave yard of the inhabitants of madina) and turn his face towards the graves and say: "Peace be to you, the believers who reside these graves. You have been given what was promised to befall you one day. You will remain here till the Day of Resurrection. We are following you. May Allah forgive the inhabitants of this place." "Do not speak ill of our dead lest you hurt our living relatives." So we see that towards the dead, towards those who are buried or on the way to be buried, Muslims must show respect, must act respectfully. The Way of the Prophet (Sunnah) was to greet them with peace and remember them with respect and pray for them and he forbade to even speaking ill of the dead, let alone harming their resting place. May God increase our knowledge and help us act on the knowledge that we are granted. Last but not the least, in every coverage of the Media on such news you will find many labels and even more importantly whenever such an attack is carried out by whosoever, it gets immediate media coverage. Those who understand the world Media at the present will know for sure that the Media never reports / invest their air-time without agendas serving their corrupt leaders. In this case one of the prime motive you will find is ignite division and hatred of one people against it's own. This is to portray Islam as a religion of the barbaric and uncivilized people. The classic "divide and conquer" strategy is also in play. As a proof of this its worth reading an article by Simon Maghakyan titled, Is Western Condemnation of Cultural Destruction Reserved Exclusively for Enemies? one can see the bias of the Western media. And this is not an isolated case. See more here. The western governments who continue to pursue the same policy of oppression, colonialization mentality, it is them who are relentless against dividing the Muslims through various labels. Muslims need to be cautious against every attempt to divide the Ummah and not forget that it lays heavy responsibility on those who knows better to educate those in the community who are ignorant and acts on their ignorance. That has been the model for the Muslims as taught by the Prophet, may our knowledge be increased to receive his sublime teachings. Thanks to the mainstream media, instead of more knowledgable ones educating those who need education, we are given the capsule of hatred of one group for other. While I was surveying news from various news group I came across more than half a dozen labels: "the Salafis", oh its "the muslim extremists", oh its "the hardline Islamists", "the ultra-conservative Islamists", "Wahhabis," "Islamist Hardliner", "Terrorists," "Hardline Salafists," "Sunni extremists," and spin of labels go on and on! So instead of teaching them, the Haqqani Ulamas (real religious scholars) distance themselves and thus the darkness in the society keeps growing and growing. Growing hated and malice towards members of the same community will only open the flood gate of fitna and nothing else and thats people needs to be cautious against. May Allah forgive the Ummah for failing to teach the sublime teaching and ways of the Messenger, may Allah forgive us for failing to implement the Universal Laws of God (Shariah) which calls for equality, human rights, justice and peace and get rid of all impurities and may Allah forgive us for failing to teach each other the Manners (adab) of the Sublime Messenger. May Allah forgive us that we are still an Ummah of ignorant people whereas our Prophet has instructed that education and illumination is compulsory on both male and female. May Allah help us in understanding the verse of Surah al-Fatiha when we say, 'Ihdina assirata al mustaqeem, Sirata allatheena anAAamta AAalayhim.' "Guide us to the Straight Way, The Way of those on whom You have bestowed Your Choicest Grace." (the Quran, 1:6) The very 'Straight Way' is defined by the people upon whom Allah has bestowed His special Grace and lets not forget that these are the Messengers, the Prophets and the Awliya Allah, who walks on the very footstep of the Illuminated Messengers of God. A commentary by Sadiq M. Alam on Technology of the Heart on the recent attack of Sufi Shrines in Libya by Hardline Extremists.